Two species of beetle that are new to Norfolk have been discovered as part of 187 different beetle varieties found at Blakeney National Nature Reserve. 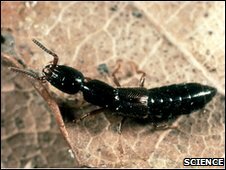 Nine experts found a Rove and a Fungus Beetle as part of a survey on "small, but important wildlife". They also found 41 lichen species, 24 types of spider and five types of ant. "We are indebted to these wonderful volunteers," said Stuart Warrington, National Trust nature conservation advisor. 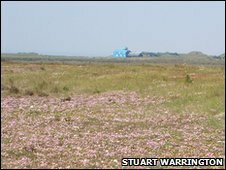 "Without them we just would not know how important Blakeney Point is for insects and other invertebrates," he added. The full names for the new Norfolk beetles are the Red Data Book Rove Beetle called Phytosus nigriventris and a nationally scarce Fungus Beetle called Leiodes ciliaris. The survey, which took place in September 2009, also unveiled a Sap Beetle Nitidula carnaria, which had not been recorded in Norfolk since the 19th Century, and the Clown Beetle Gnathoncus nanus with only its second appearance in recent history. Nationally rare ant species Myrmica specioides were also discovered. The survey rounded off a successful summer for wildlife at Blakeney Point, famously known for its seals, as its breeding birds had a good season with the Sandwich Tern colony growing to 3100 pairs, up from 2400 pairs in 2008. Other highlights were the 86 pairs of Little Terns that nested on the Point's shingle beaches and produced 52 fledglings and 13 pairs of Ringed Plover, which raised 12 chicks. "The success of the terns depends on a whole range of factors including a supply of small fish, good weather and tides, and not too much disturbance," said David Wood, National Trust head warden at Blakeney. "Last summer's successes were thanks to good conditions, the hard work of staff and volunteers and the understanding and support of visitors and the local community," he added.